Scroll down to see our selection of vinyl exam gloves for sale. Vinyl exam gloves are used by doctors during routine examinations. 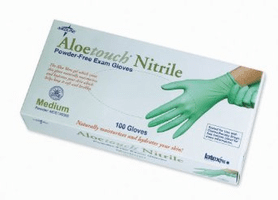 We carry a selection of vinyl exam gloves for sale including lightly powdered vinyl exam gloves, non-powdered vinyl exam gloves and latex free vinyl exam gloves. What are vinyl exam gloves? Vinyl exam gloves are disposable devices intended for medical purposes that are worn on the examiner’s hands to prevent contamination between patient and doctor. Examination gloves are ambidextrous, feature a beaded cuff for easy donning, have a smooth finish and translucent color. Vinyl examination gloves allow the wearer to feel things easily through them which is critical when examining a patient or performing surgery. All of our gloves are now labled for use in California. Even if noted "CA Only" we can now ship these to all states, not just California.